(*) Discounts on F & B are defined as meal plans, F & B incremental items purchased in the resort. The discounts are applicable in the restaurant, room service, and bar. (***) Complimentary non alcoholic beverages in the mini-bar. The mini bar will be replenished once per day. Selected excursions are Maha Vihara temple, Richmond Castle, Brief Gardens, and deep sea fishing, and moonstone mines. 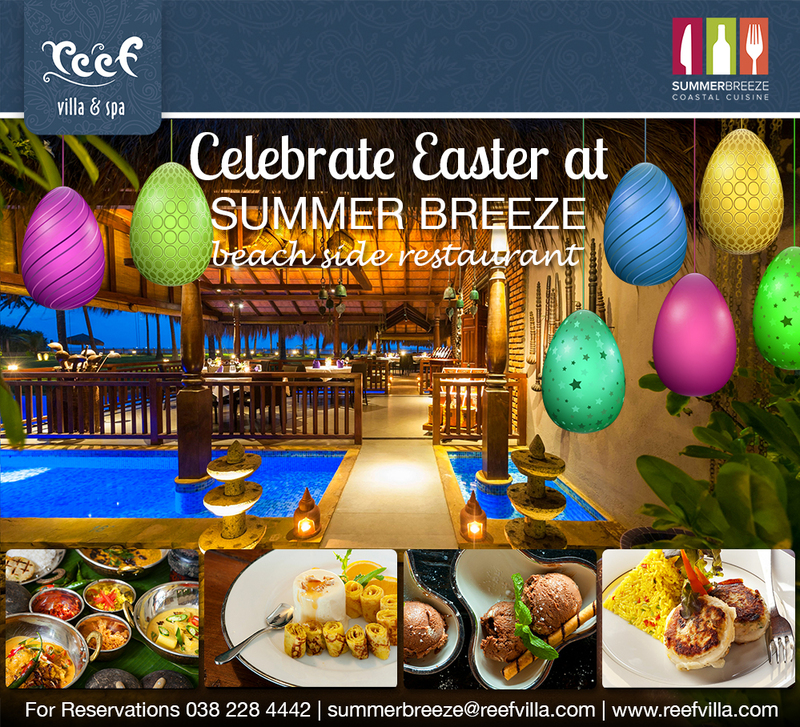 Reef Villa & Spa. ("Reef Villa & Spa" or "we") may change the loyalty program (the "Program") rules, processes, regulations, and special offers at any time, with or without notice. Reef Villa & Spa reserves the right to terminate the entire program with-out advance notice to all then-Active Members, and immediately upon notice to all then-Active Members in the case of a termination relating to the substitution of a similar replacement program. We reserve the right, in our sole discretion, to immediately discontinue if a member acts in a manner inconsistent with local laws or in a fraudulent or abusive manner; otherwise misuses the benefits of membership; or fails to pay any valid bill or account when due to Reef Villa & Spa. Reef Villa & Spa and reserves the right to correct, any pricing or typographical errors, errors of description, or errors regarding its property. One stay is defined as seven room nights in terms of stay counts. The guest who is paying for extra rooms will have these rooms counted in their stay to a maximum of two rooms. The guest staying in the other room does not receive the room night's reward. You will need to exceed the nights stayed and stays to achieve the next level. All interpretations of these Membership Rules, terms and conditions shall be at the sole discretion of Reef Villa & Spa. We request that you highlight on your bookings that you are a return guest on a reservation made with the resort whether it is via a travel agent, direct or via an online travel agent. Black out period of 18 December to 15 January applies. Stays/room nights may be accrued during this period but benefits are not applicable. The date of commencement of the Reef Elite Club is 1st September 2013. Spa credit voucher is not available with any other offer. Food and beverage discounts is available on full price menu items only and is not available on Happy Hour or other promotions. Complimentary nights may not be counted towards stays. Credits are not issued for stays for certain package rates, special discounted contract rates , third party web sites, complimentary hotel stays. Reef Elite applies only to bookings made directly with Reef Villa & Spa.